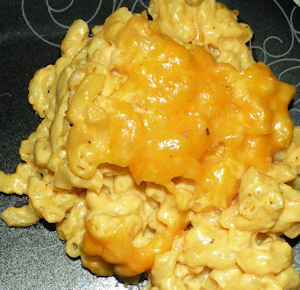 Whats more soulful than a heaping of mac & cheese. Old school baked that is and here in the Porter House it’s a tried and true staple. Anytime we can have it. We make it. It’s just that popular. I believe it’s one of the most requested. It’s a great accompliment to the main course but good enough to stand alone. Behold the POWER of cheese. Cook macaroni or shells according to the directions on the box. Drain and set aside. Butter or spray a 13 x 9 casserole dish. Next mix the cooked macaroni or shells, evaporated milk, whole milk, butter, salt, pepper, and dry mustard together. In a separate bowl whisk the eggs and slowly add 1/4 cup of the macaroni mixture (this is to temper the eggs). Now combine the egg mixture to the macaroni mixture. Next add all of the grated white cheddar cheese and mix. Pour macaroni and cheese mixture in the greased casserole dish and evenly sprinkle all of the yellow cheddar cheese over the top. Place in oven and bake for 50 minutes or until cheese is bubbly. *Chef’s Note: BYOC (Be Your Own Chef) and use what ever cheese you like. If you don’t like Sharp Cheddar use Mild Cheddar. Or Provolone. Or Gruyere. Or whatever floats your boat. The options are endless. Posted on July 8, 2012, in Lady Fab Cooks and tagged butter, cheddar, cheese, dinner, dry mustard, entree, food, macaroni, milk, recipe, shells, side dish, vegetarian, white cheddar cheese, yellow cheddar. Bookmark the permalink. 18 Comments. The mac and cheese entree is requested six months in advance. It has made the number one food staple of the year. If you wants smiles on holiday……..just say mac and cheese. You are sure to be happy. Please check your cholestrol levels afterward. Being that it is so hard to have just one serving. It is advisable to do a strenuous workout the weeks before and the weeks after. And if you are a diabetic bring your glucose meter. LOL. Trust me we have people checking their blood sugar levels after the meal. Not to see how high it is but to see if they can indulge some more. whoah this blog is wonderful i love reading your posts. Keep up the good work! You know, a lot of people are looking around for this information, you could help them greatly. We are a gaggle of volunteers and starting a new scheme in our community. Your web site offered us with helpful info to paintings on. You have performed an impressive activity and our entire community will be grateful to you. Hello there! I could have sworn I’ve been to this blog before but after reading via some with the post I realized it is new to me. Anyhow, I’m definitely happy I located it and I’ll be book-marking and checking back often! Thanks for stopping by and showing my blog some love.